The functioning of the new Internet Explorer 9 seems to be decent even without menu and tool bars. But you still wish to have some of those bars and want to activate them. With its minimalist interface, Internet Explorer is following in the foot steps of Google Chrome. This display takes a little getting-used-to but proves to be absolutely advantageous once that is done since it leaves so much more space for the website without changing the functioning too much. But anyone who does not want to do without the usual bars will keep bringing that up again and again. This however cannot be done via the options in the setting dialog. Right click a free spot of the title bar. 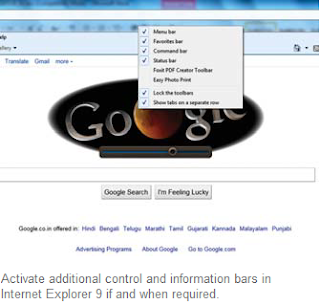 Then activate the ‘Menu bar’ or the ‘Status bar’ in the context menu. You can also enable a ‘Command bar’ in Windows Vista as well as the ‘Favourite bar’ from here. What is a little confusing is that the tabs are arranged near the address field. Although this saves space, it can at times lead to confusion between the tab and the address field and cannot display a lot of tabs simultaneously. If you want to see the tabs and the address fields separately, right click on a free space of the title bar and select the context command ‘Show tabs in a separate row’. NOTE: If you opt for this compact user interface, you can always access the menu bar with [Alt].